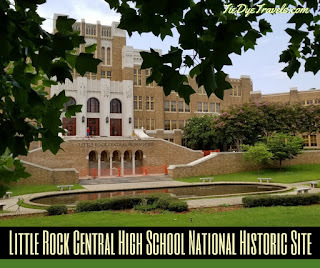 Required Visitation - Little Rock Central High School National Historic Site. 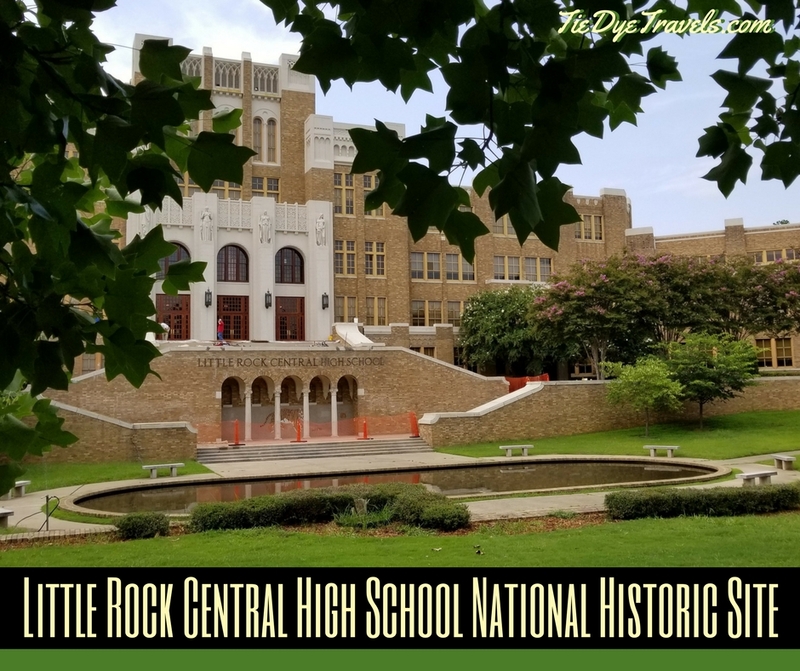 A visit to the Little Rock Central High School National Historic Site Visitor Center may make you hopeful, ashamed or even angry – but most of all, it will make you think. The events of September 1957 are being remembered this month on this 60th anniversary of the integration of Little Rock’s prestigious high school – but the forces that surrounded the actions of that month bear remembering, as well as the repercussions that followed. Catty-corner from Central High – which is still in full operation – sits a National Parks Visitor Center for those who come to learn about what happened here. The two facilities have a separation of time and purpose. Within the school, students are preparing for their future, while at the center others are focusing on the past. It’s not a glorious one, not in this respect. In 1927, the federal government gave the city of Little Rock $1.5 million dollars (equivalent to more than $20 million today) to build two new high schools in the name of separate-but-equal. It went into the creation and construction of a massive, six story block long edifice for white students that was considered on completion to be “The Most Beautiful High School in America” by the American Institution of Architects. Nothing was left for black students, so the black community of Little Rock banded together and raised money with bake sales, lawn mowing and other actions to match moneys granted by the Rosenfeld Fund. The $400,000 raised went to create Dunbar High School, named for black poet Paul Lancaster Dunbar, built on plans by the same architect that designed Central’s imposing structure. The National Historic Site’s Visitors Center notes this history and the conditions of the separate-but-equal buildup following Plessy Vs. Ferguson, the landmark case that called for separate facilities to be provided for white and black Americans. It also covers the 1954 U.S. Supreme Court decision to end that practice, declaring segregation in public schools unconstitutional; how Little Rock’s school board held firm against that decision and the later admonition that integration happen “with all deliberate speed;” and the incredible standards the first black students to apply were held to before they could cross the threshold at Central High. History books in schools often mention the 1957 Central High School desegregation crisis, but few delve into the rigors these students were required to meet before even being considered – perfect grades, perfect attendance. They wouldn’t be allowed to participate in athletics, and they would not be allowed to fight back against anything done to them. Despite the restrictions, 200 students applied for the first class. Some dropped out of the process because of the restrictions; others removed themselves over threats called to their homes or places of business. In the end, ten students were allowed to attend. They met a street full of vitrol that morning of September 4th. After Governor Orval Faubus called for the Arkansas National Guard to "accomplish the mission of maintaining or restoring law and order and to preserve the peace, health, safety and security of the citizens of Pulaski County, Arkansas” on Labor Day, and a decision was made not to send these students to Central the next day. That Tuesday night, each of the ten students were called to meet at the home of Daisy Bates – the president of Arkansas’s NAACP at the time. However, the family of Elizabeth Eckford did not get the message. They had no phone. This is where the tour takes you from the visitors center out to the street, where an interpreter waves towards the different parts of the street – the direction Eckford came from after stepping off a bus a few blocks away, the section where a crowd of more than 1000 angry white men and women would stand in the street, the line where National Guardsmen created a human barrier. A brief stop is made at the tiny white gas station – restored to its appearance in 1957 – where members of the media lined up and waited for hours to voice their copy to their news outlets over the only public telephone nearby. The interpreter shares how nine students were escorted by Bates, two white ministers and two black preachers up to the school, where a National Guardsman told them they could not enter – and how one of the nine in that group, a 10th grader named Jane Hill, would not try again. The tour continues down the sidewalk in front of the school as the interpreter lays out the path of Elizabeth Eckford, who instead of turning when she saw the crowd walked into it, getting spit upon and jeered. When she reached the barrier formed by the Guardsmen and was turned away, how she proceeded through the crowd, how a reporter from the New York Times would sit with her as she waited on a city bus and how he’d lose his job for that action, how a woman named Grace Loach would stand up to the crowd and be jeered for it. During the summer and on some school days, the tour proceeds inside. No photos are to be taken for the sake of the privacy of the school’s nearly 2500 students. A stop is made in the vestibule at the top of the entry stairs, where a case displays the photographs and some of the personal effects of the Little Rock Nine. Then the tour is escorted into the auditorium, where in the front right section the interpreter talks about what happened next – how on September 22nd, the nine remaining students were escorted in a side door by police, how word got around that they were inside and the crowd that formed, and ow they were taken out the back door and driven out in the floorboards of cars. President Dwight D. Eisenhower, frustrated with Arkansas’s governor, federalized the National Guard and sent in the army to ensure safe entrance for the nine on September 25th, 1957. That’s where the story ended in media coverage – but the tour picks up. The interpreter talks about life inside the school for these students – a horrific tale of bullying, the blind eyes of administrators and the outright cruelty of classmates. The rules clearly stated the black students could not reciprocate, and they didn’t. More is shared, including the vote the following year that resulted in the closing of four Little Rock high schools – including Central – for the duration of the 1958 school year. And then the following year, when the oldest of the Little Rock Nine managed to complete coursework for graduation. He was only offered a few tickets for graduation, but one of those who attended on his behalf was none other than Martin Luther King, Jr. The tour progresses outside and across the street to a special, newly constructed park, where tour members are given the chance to answer questions and to reflect on what happened at the school. Two arches, covered with photographs from the school, show not only the actions of September 1957 but the school’s entire history. Within the visitors center itself, more exhibits show what life was like at the time of integration. A gift shop carries books about the crisis, along with appropriate educational materials and souvenirs of the visit. The Little Rock Central High School National Historic Site Visitors Center is open daily 9 a.m. to 4:30 p.m. throughout the year, excepting some holidays. It’s located at 2120 West Daisy L. Gaston Bates Drive in Little Rock. Tours are only offered on weekdays at 9 a.m. and 1 p.m. and require a reservation. For more information or to sign up for a tour, call (501) 374-1957. Further information is available on the National Parks Service website. What does this have to do with a column on FOOD? Does everything have to come from a political view now a days? Pardon me. A few points. 1. Tie Dye Travels is a food and travel website. 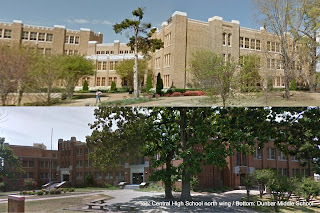 The Central High School National Historic Site and its Visitors Center are common Little Rock travel destinations. Tourists looking for places to visit when they come to town could utilize this information. See entries amongst the 1100 articles on this website for such places as Calico Rock's historic ghost town, the Arlington Resort Hotel and Spa, the Kenda Drive In, the H.U. Lee International Gate and Garden, the Hemingway House of Key West, Dogpatch USA, the World's Largest Things in Casey Illinois, Front Porch Stage in Mount Ida, digging for diamonds at Crater of Diamonds State Park, the ruins of Monte Ne, the Fouke Monster, the Four States Auto Museum in Texarkana, the arch on US 61 at the Missouri-Arkansas border, Cotter Bridge and the Branson Scenic Railroad - to name a handful. 2. I don't write about politics - with the exception of food-related things such as the raw milk bill (which passed, which means yay, we can make some cool local cheese here in Arkansas). Thank you Kat. I've loved your blog and will be posting this to my social media feeds. The fact that someone with the ID of "Anonymous" would question your posting is hilarious. Yes, anyone who follows your blog would know that it's a food and TRAVEL blog that provides a great look at our state. Hardly a "political" article unless you disagree with the politics of integration. Keep 'em coming. I must get there myself one day. It's sad how long I've live in Arkansas but never visited. Thank you Kat! I loved your post about Central. I graduated from there, and while I've been back to the school since, I've never done the tour. I'll post this to my social media as well. Two thumbs up to your reply to "anonymous", by the way.